If you’ve read Plaguewalker, thank you (and thanks to those of you, friends as well as several strangers, who’ve left such thoughtful reviews on Amazon and GoodReads). You’ll know, then, that Marcus is a man of few words, a practical man and also, perhaps more than anything, a man often puzzled by basic human interaction. The notion of befriending someone, or even simply engaging in pleasant conversation, flummoxes him. He is also an honest man, often brutally so. He would be hopeless in politics, advertising or, it must be said, stand-up comedy. So I’m trying something new, and that might be how you found your way here: advertising. If you’ve landed here via Facebook or my travel blog, Stories That Are True, or the smattering of newspaper and magazine articles about me, welcome. Here’s the deal. Plaguewalker is a dark but ultimately redemptive historical novel set in fourteenth century Bavaria. You can read the first chapter for free or download the first 20% or so, also for free, onto your Kindle or iPad through Amazon as a sample. You can also read one of my previous posts on this blog that covers a little bit of my inspiration for the novel. I hope that you’re interested enough to check out the book in eBook (Kindle or Nook) or paperback format and that, if you do, you enjoy reading it. It’s not for everyone, but I believe it’s a good story. A highly biased opinion, yes, but, like Marcus, I tend to be brutally honest. I didn’t write it to make money, or to find fame. I wrote it because it was what I, as a reader, wanted to read. Regardless of how you found your way here, thanks for reading, and thanks in advance if you decide to walk the cold, snowy road to redemption along with Marcus. Now, speaking of cold and snowy, I’m off to take a walk myself. It’s a lovely day here in Antarctica. The wind chill is a mere minus 16 F and the midday skies are black and starry. And no, I am not making that up. Well, it’s happening. 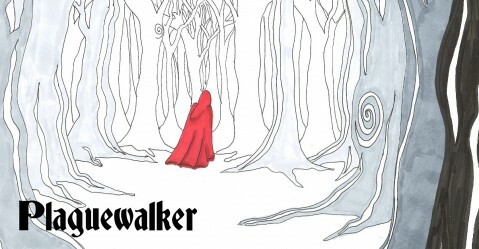 Plaguewalker is now available in Kindle format on Amazon for a mere $2.99. That’s less than a Starbucks latte! The paperback version is completed and ready to print–I’m just waiting for the thumbs-up from Amazon for the eStore to go active, hopefully within the next few days. The whole process of getting Plaguewalker published in both print and eBook formats took longer than planned and involved many more steps than envisioned. But I’m happy to say I learned a lot, and that it ended up costing significantly less than I’d feared. My biggest expense by far was purchasing a package of ten ISBNs from Bowker. That set me back $250. But a single ISBN costs $125, and I knew I’d need at least two for Plaguewalker alone (one for the print and one for the eBook edition), plus two apiece for my upcoming fantasy novels The War’s End and The Guardian. I decided to purchase my own ISBNs instead of using free ones through CreateSpace because the latter have restrictions on them, and would record CS as the publisher, not Grunaskhan Books. The process for assigning an ISBN to a title was a little more involved than I’d figured, but the page Bowker has set up is extremely user-friendly and I was able to get both editions completed in a matter of minutes. I spent months researching different POD (print on demand) companies and went with CreateSpace because of the reach of their distribution, through Amazon, and the number of free tools they have. Now that the process is finished, I would say I’m very happy with the result. During the process, however, I wished a pox upon the House of CreateSpace more than once. If you do use CS, the biggest tip I can give you is not to waste time contacting their customer service or consulting their Help Guide if you run into trouble. Just go to the community forums and search for a thread on your problem. You’ll find the solution much faster. You can spend a lot of money setting up a title through CS, but I went the DIY route and made use of their free tools, including a downloadable template for my novel’s trim size and a Cover Creator that turned my JPGs into a PDF. My only expense associated with the whole process was buying MS Word for $100. I had been using OpenOffice for word processing but found it would not play nice with the CS template. Since I needed Word anyway to view some unrelated documents in Excel, I decided to bite the bullet and just buy it. I can’t comment on CS cover services since I didn’t use them, but they did seem kind of pricey. I’m no DaVinci, but I had a very clear vision of what I wanted the cover to look like. So I drew it myself. The only expense here was buying a pad of good Artist Marker paper ($8) and six Prismacolor Markers (about $12 for the markers, thanks to a 50% off sale…I do love a bargain). I shopped around for a free commercial-use font and settled on Deutsch Gothic from FontSquirrel, my absolute favorite font site. I’m also extremely lucky to know a very talented and detail-oriented copy editing goddess, Dulcie, so I was able to skip hiring a freelance editor or using CS’ service. My only other expenses were a few dollars here and there to scan my illustration into a JPG and register this domain. I also spent about $30 on downloadable guides to specifics aspects of the publishing process, such as how to set up a copyright page and use an ISBN, from The Book Designer. I didn’t buy his stuff until I’d followed his blog for a while and realized the wealth of information offered there. If I had to recommend a single starting point to learn about this process, I would point you to his site. A crazy amount of information in very user-friendly form. His site is particularly useful for understanding the visual elements of book design, from page number positioning to choosing an interior font. Once I got the paperback version finished and approved at CreateSpace, I tried to convert it to Kindle form at KDP. This started out as a comedy of errors but I dug around the community forums and found a link to a free ebook that explained, step by step, how to convert a Word file into Kindle-friendly HTML. Without this book I might still be weeping into my Tension Tamer tea. In the end, from first try to seeing those magical words “Conversion Successful,” it took a couple hours and cost me nothing. According to the CS site, they would have charged me $69 and taken weeks to do the same thing. I’m still tinkering with the eStore for the paperback, which is not yet live. I’ve just started figuring out the whole marketing approach. It will be weeks or months, I expect, before anything comes of this venture. But right now, regardless of what happens next, I feel a sense of accomplishment just getting through the process wiser but not much poorer. I’ve already learned a tremendous amount that will make getting the next two novels ready a zillion times easier. If you’re thinking about indie publishing, I hope the above was helpful. If you’re not thinking about indie publishing but have been wondering what I’ve been up to the last few months and why I never return your emails, well, there you have it.